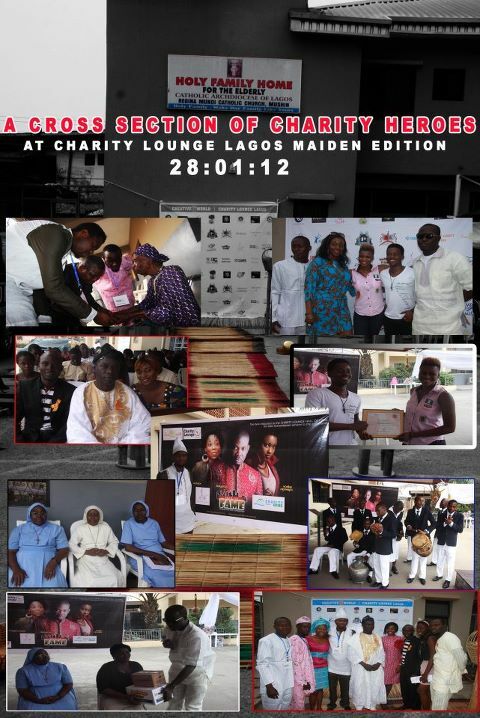 The upcoming Second Edition of Charity Lounge Lagos hopes to highlight its ‘Fantastic Four’ nominees—four individuals and four initiatives have been nominated for the Hall of Fame and they Include: Stella Damasus, Innocent ‘2face’ Idibia, Julius Agwu and Funmi Iyanda while the initiatives list includes: The Future Project, Lamboginny Say No to Crime, Save Laura Campaign and Bake For Change. The Maiden Edition premiered in Mushin; Lagos reaching out to youths and the young at hearts. On 28 January, 2012, Creative Five World hosted an exclusive Charity Lounge Lagos event tagged “Charity Begins at Home with the Oldies.” The event featured the induction of celebrities such as Ronke Apampa, Michael Collins and Tosyn Bucknor into their Hall of Fame. This was for their immense contributions to charities and they were referred to as the “Compatriots with Compassion”. Presentations were also made to the Holy Family Home from the Elderly, Bethesda Home for the Blind and Lagos Cheshire Home for the Handicapped. Chaste Inegbedion, Community Relations Specialist of Creative Five World said Charity Lounge Lagos is dedicated to creating innovative ways such as the Cancer Campaign, Hall of Fame and Charity Begins at Home initiatives to engage Nigerians and the rest of the international community to secure sponsorship. According to Wale Ewedemi, DG, Creative Entrepreneurs Association who described the initiative as the Birth of a New Nation in Community Service endorses the need for Corporate Nigeria and Philanthropists to throw their weight behind such laudable project. Charity Lounge Lagos is a quarterly event and is expected to move around the Lagos metropolis as a change-oriented event.